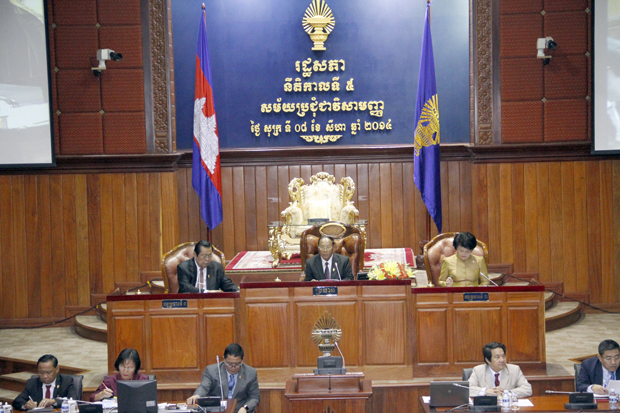 The National Assembly (NA) of Cambodia held here this morning an extraordinary session of the 5th legislature to discuss and approve the request to amend the new Principle 6 of the NA’s internal regulations. 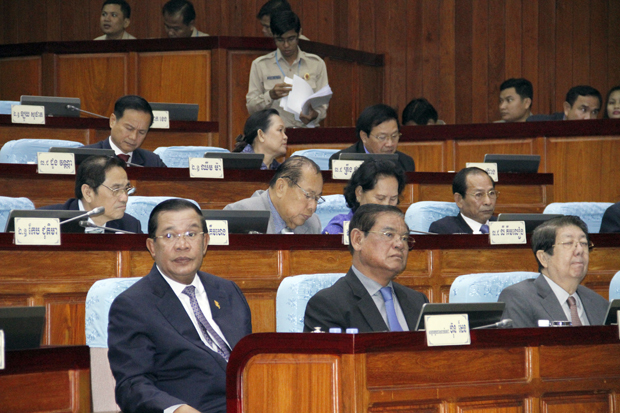 The session took place under the presidency of NA President Samdech Akka Moha Ponhea Chakrei Heng Samrin with the participation of 122 parliamentary members of the ruling Cambodian People’s Party (CPP) and the main opposition Cambodia National Rescue Party (CNRP). Addressing to the meeting, Samdech Akka Moha Sena Padei Techo Hun Sen, Prime Minister of Cambodia and Vice President of CPP, welcomed the presence of the 55 CNRP’s lawmakers at the session. He also called on the public to note down the CPP-CNRP leaders’ comments this time, and requested the CNRP to stop “coloring” (slandering) and to reduce criticizing each other in all forms. For his part, H.E. Sam Rainsy, President of CNRP, asked both CPP and CNRP to respect the political agreement on July 22, 2014, which ended the political crisis between the two parties. He further appealed to CPP and CNRP to adopt the culture of dialogue, cooperation and negotiations for the nation’s interests. Moreover, he thanked Samdech Techo Hun Sen and Interior Minister H.E. Sar Kheng for their hard works for the political resolution. Under the political agreement on July 22, 2014, CPP and CNRP agreed to reform the National Election Committee (NEC) whose members have to be approved by 50-percent plus one. This electoral institution is composed of 9 members (4 nominated by the ruling party, 4 by the party/parties which is/are not in the government, and 1 by a consensus between the parties that have representatives in the NA). 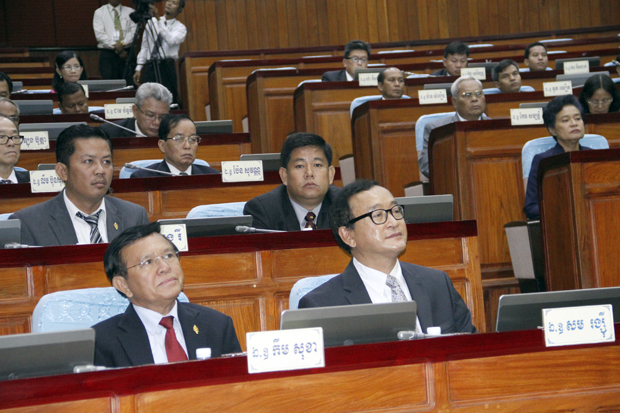 Both political parties agreed to re-organize the NA’s leadership by dividing the leadership role in the Standing Committee by the 7 to 6 formula, and by establishing another NA’s commission – the Commission on Investigation, Clearance, and Anti-corruption and this new commission will be chaired by a CNRP lawmaker. With the new structure, the NA president will be from CPP, the first vice president from CNRP, and the second vice president from CPP. CPP will chair the NA’s 2nd, 4th, 5th, 6th, and 9th commissions, while CNRP will chair the 1st, 3rd, 7th, 8th, and 10th, the newly established commission. Besides, the two political parties agreed to re-arrange the date for the next elections, but not to hold the re-election, and also agreed to examine the re-organization of the Senate’s leadership, as well as to reform and strengthen key state institutions, especially the independent institutions so that they can serve the nation and people in accordance with the principles of multiparty democracy and the rule of law. The official results of the July 28, 2013 national election showed that CPP won 68 parliamentary seats, while CNRP got the remaining 55 seats.